Chobani and Muller have both come out with these fascinatingly delicious yogurt cups that have a side container of various toppings. These are not only great to eat but also an easy way to make unique muffins in a snap without having to buy lots of extra ingredients. Preheat oven to 350F. Prepare a muffin tin by lining it with paper liners. In a large bowl sift the dry ingredients. Make a well and mix the wet ingredients and yogurt cup until combined. Fill each muffin cup ¾ full. Mix the topping ingredients together until crumbly. Sprinkle each muffin with topping. Bake for 20 minutes until center comes out clean. The nuts in a lot of these flip type yogurts are large for muffins. If you want smaller pieces run it through the food processor. 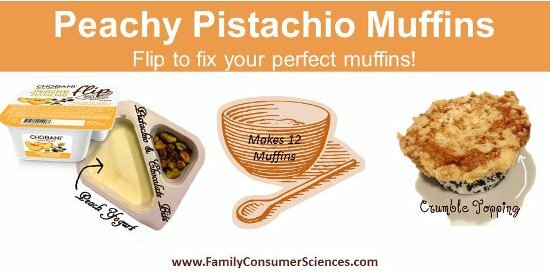 If you want to add more flavor chop a 1/2 cup more pistachios and add to topping mixture. Bisquick Alternative: 2 C Bisquick, 1 container of Yogurt, 1/4 c. sugar, 1 egg bake at 400 for 20-25 minutes. I added 2 eggs instead of one as with one egg the batter was too crumbly. Cut the topping recipe in half. the final product was a hit a great way to teach yogurt as a substitute. Thank you for sharing your adjustments! !